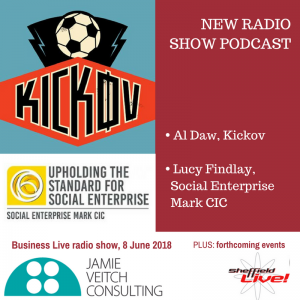 This week’s radio show features live studio guest Al Daw and an interview with Lucy Findlay, founder and MD of Social Enterprise Mark CIC. Al discusses his unique immersive Soviet soccer experience, Kickov. Celebrating all nations in one city, the Kickov festival at Abbeydale Picture House starts on 14 June with a World Cup opening party featuring live traditional Russian music, street food and more. The free to attend festival includes comedy, DJs, live bands, interactive quizzes, fancy dress and craft beer. There’s plenty for everyone, football fans and non-fans alike, plus the opportunity to watch most of the World Cup games on a massive screen, the biggest in the region. Al also describes the inspiration which kicked off Kickov; a similar fan park he created at Old Street roundabout in Shoreditch, his work as an artist and exciting plans for a building. Is business a force for good? On Thursday I went to a fascinating event, “Sharing the Wealth,” The Social Enterprise Mark’s conference in York. At the end of the event Lucy Findlay, founder and MD of The Social Enterprise Mark CIC joined me for an interview. Lucy describes the process behind certification as a Mark holder; helping social enterprises to articulate their impact and how they make a difference; and the Social Enterprise Gold Mark. She also covers the rationale behind the “Sharing the Wealth” conference and how business done differently can be a force for good and a force for change. Lucy gives examples of organisations taking a different approach to business, and makes a strong case for businesses and social enterprises to tackle societal problems. Lucy also calls for business schools to avoid taking too narrow an approach to education – missing out on the opportunity to give students what they want. 24:39 – 28:07 is business a force for good? 44:13 – 45:51 wrapping up and upcoming events. Check out the Kickov Festival website, Al Daw’s website, and The Social Enterprise Mark CIC website.